Easy-grip spatula works as tongs and flipper to flip, turn and easily grab what you’re cooking. Like an extra pair of hands, it reaches in to grip and flip french toast, burgers, even hot dogs! Heat-resistant plastic; dishwasher safe. 11½"L.
I ordered this product mainly for use in cooking grilled cheese sandwiches. In the past, using a single-side spatula to flip the sandwiches while cooking, the cheese and part of the sandwich would slide off, and I was never able to get them lined up again. This spatula is perfect for this. I love this spatula! I've had mine for many years and I'm online ordering more to give as gifts this year. I use mine all the time. I don't use it for pancakes because it would be awkward with the tong part but it's great for things that might break apart while flipping like fish or grilled cheese sandwiches (I use shredded cheese in my sandwiches so I can really grab then to flip them over without all the cheese coming out.) I've never used it for eggs so maybe the photo is deceiving. Of course it shouldn't be your ONLY spatula but it's definitely a nice addition to your utensil drawer. Easy to use. Prevents splatters when turning food in frying pan. buying another, so he can fry his on eggs. I bought this as a gift for my dad, yet, for my mom to use to make his favorite food. My dad loves these salmon patties that mym mom makes for him(he likes Sponge Bob, and calls them crabby patties), and this was a perfect tool for her to pick them up anf flip them. This product is GREAT for flipping eggs without the eggs breaking. Also handy for flipping other items such as burgers! IT IS JUST VERY EASY TO USE. YOU CANNOT SAY ANYTHING BAD ABOUT THIS GADGET. KUDOS TO THE PERSON WHO INVENTED IT. I found this aparatus years ago and I was so happy to come across it once again in the Internet. You can flip things w/o splattering grease everywhere. I absolutely love this spatula. Since Miles Kimball has it in stock again I am buying some for Christmas gifts and getting several more for myself. No kitchen should be w/o one or three! I have been looking for this spatula for a long time, since the one we had has been used for years. This is a new design, but we love it. I actually purchased two as a gift for my husbands birthday. He was so glad to see I had found these. Thank you for a great product. Need a little practice to be able to maneuver the egg into the slot, but once achieved it flips without breaking the yoke. One of my favorite kitchen tools. I don't do eggs over easy, but it would be great for that. My favorite use is for turning fish fillets in the pan. I use it to turn hamburgers in the pan to keep the grease from splashing. I also use it for grilled cheese sandwiches, which tend to come apart when turned. In fact, it is great for turning over almost anything.. While not flimsy, it is not suitable for turning over heavy stuff -- which you probably don't need to handle carefully anyway! I use it to fry eggs, fish. easy to turn and no oil splatter. Flips eggs, burgers, crispy hash brown potatoes and more. A little flimsy but you can get the job done. i bought this item to facilitate making eggs over easy. it works better than my own prowness exhibits but would be better if it was a little wider. It works well for grilled sandwiches. It would be nice if it was a little thinner for eggs. A great idea for fried eggs over easy! I use it for making fried eggs over easy. The grip is too weak to actually hold food, such as a fried egg, firmly. No help at all. Did not function as described in advertising. This would have been a really great idea if only the two parts would have stayed together! It breaks the egg yolks. It is very clumsy. Doesn't work with pancakes. I just haven't found anything that it works for. I tried removing cookies to rack. Didn't work. You will be better off by buying several specialty tools. I was so excited to try this out. Unfortunately it isn't what I expected. The forked part just slides into the handle of the spatula. 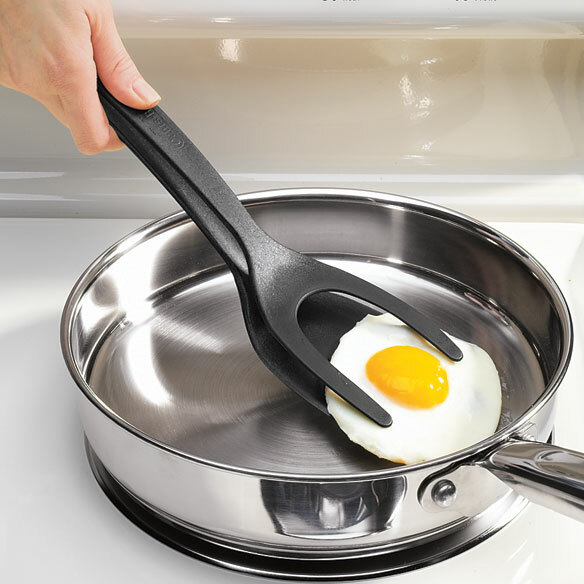 You can't get the spatula under the egg enough to use the forked part, and it doesn't clamp tight enough due to that and the poor design. Not worth the money. I have tried using this a couple times with frying eggs and it does not work good at all for me. I would not recommend it. Broke in half the first time I used it. I looked forward to receiving this tool, but unfortunately found it difficult to use. The surface was to small to grip and flip eggs and/or pancakes successfully. my husband needs all the help he ca\n grt. I currently use one and need to replace it. I have been looking for this for a long time! Have one that I love and ordered another for vacation cabin. would like to see if it going to be a good spatula and helps me not break the eggs. Am 73 yrs young and love to make grilled cheese sandwiches. This is something I know I will use a lot. Because my mom is crazy. I have one and I love is for grilled cheese sandwiches.